Happy New Year from the ClearContext team! Thanks so much to everyone who has upgraded to v5! There are a number of big changes in ClearContext v5. This post provides information about these changes, links to relevant forum discussions, and a little bit about what we’re working on now. We hope this will post will answer your questions about v5 and help you get the most out of the software. We’ve posted a list of changes in v5 on the upgrade page, along with a little more detail in this blog post. We’ve also (mostly) updated the User Guide. Multi-machine support – if you run Outlook on multiple machines, you can now run ClearContext on all of them at the same time! 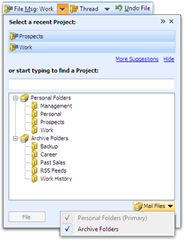 2010 Support – v5.0 provides provisional support for the Outlook 2010 x86 beta. We’re working on 64-bit support. Message Prioritization – Known and important messages are now marked with “CC OK” or “CC VIP” categories. Set ClearContext >Options >Configuration to use icons or flags for prioritization. Contact Prioritization – Click the Mark Important button on contact records to highlight emails from that person as important. Views – Outlook color categories now take the place of the old ClearContext inbox views, but we’ve provided 3 color-coded inbox views for people who prefer them. See this forum thread for discussion and to offer suggestions on specific ways you’d like to have v5 organize and display your email. 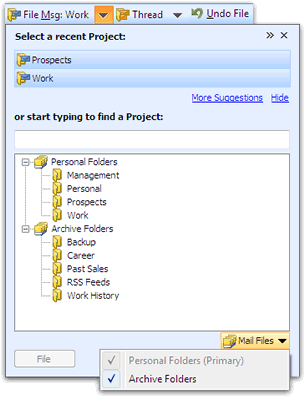 Options – some options in v5 can be configured to work more like v4 if that’s better suited for your personal workflow. Details here. Some v4 features are being redesigned for v5 and will be in later 5.x releases. 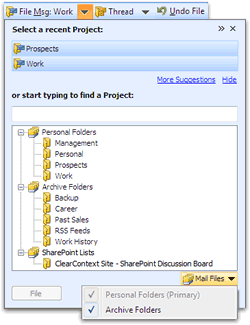 FolderContext – The Project Dashboard displays all information that was in the v4 FolderContext. This functionality will be redesigned for the 5.1 release. Delete upon reply – we’re planning to add this feature to v5.1. Please add any thoughts/suggestions about how you’d like it to work in this forum thread. File topic – we’re planning to add this feature to v5.1. Please add any thoughts/suggestions about how you’d like it to work in this forum thread. Notification Managers – Existing Notification Managers will still function, but you can’t edit or create new ones in v5.0. This functionality is being redesigned to be more powerful and easier to use along with AutoAssign for v5.2. Alerts – v5.0 does not include Alerts. This functionality is being redesigned along with Notification Managers and AutoAssign for v5.2. IMAP – We are currently working on IMAP support and will post an update on progress prior to 5.1 release. We hope to have some level of IMAP support in 5.1, but we won’t know for certain until we get deeper into testing. Office 2010 x64 – similar to IMAP, we hope to support this in 5.1, but we won’t know for certain until we get deeper into testing. We’re very excited about v5 and look forward to all your feedback to help make our upcoming releases as close to perfect as possible! Thanks! ClearContext v5.0 Released to Production! We are pleased to announce that ClearContext v5 has been released to production! And of course all of ClearContext’s powerful task, schedule, and project dashboard capabilities! Read more about v5 here. We’ll have new videos and tutorials for v5 coming soon! Download ClearContext v5 today to get more done in Outlook than ever before! Posted by brad at 8:03 pm on December 9th, 2009. Release Candidate 2 (v5.0.1) for ClearContext v5 is now available for download here. As we posted earlier today, we identified one major issue in RC1 this morning. We’ve fixed that problem and a few additional minor issues in RC2. It appears only a small number of users were impacted, but if you installed RC1 and had any issues, please see this forum post or contact support@clearcontext.com for assistance. Our official 5.0 production release will follow shortly, including updated user guide, other documentation, and information on upgrading. In the meantime, please give the release candidate a try and post your feedback in the beta forum. ClearContext Connect Members: You should have already received an email with your v5 Pro license key. Please contact us if you haven’t received your key. v4 users who purchased a pro license after August 1, 2009 will also be sent a v5 Pro upgrade key shortly. Posted by deva at 8:39 pm on December 3rd, 2009. We’ve identified an issue with ClearContext Release Candidate v5.0.0 that may cause some contacts to be deleted in certain Outlook configurations. This issue can occur during Setup when upgrading from v4.6 and earlier. It does not impact upgrades from Beta 2 to v5.0.0 RC. For most Exchange users, switching to your Contacts folder and selecting Tools->Recover Deleted Items should allow any affected contacts to be restored. If you have been affected by this issue, please email support@clearcontext.com as soon as possible for assistance. We advise not to connect or sync Outlook with other PCs or devices before fully backing up your contacts from them. We have pulled down the 5.0.0 build and will have a fixed release up as soon as possible. Please wait for that build to install ClearContext v5.0. Our sincerest apologies to anyone affected by this issue. The release candidate for ClearContext v5.0 is now available for download here. For more info about changes and new features in v5, see this post. We’ve addressed much of the beta feedback; updates have been posted in the beta forum. Our official 5.0 production release will follow shortly, including updated user guide and other documentation and information on upgrading. We’ll be making more in-depth posts about 5.0 features in the coming weeks, as well as letting you know about the new features planned for the 5.1 and 5.2 releases. Stay tuned to the blog for all the latest info! ClearContext Connect Members: Installing v5 will start a 30-day v5 Professional trial. You will be emailed your v5 Pro license shortly.